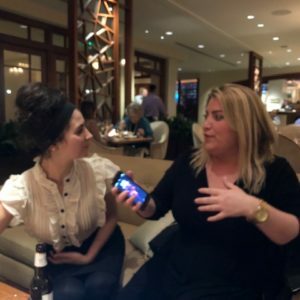 Bridge-Builders: New Yorker Sarah Ní Mháirtín, sales manager with the Irish Echo, and Bostonian Laura Hamilton of the Boston Irish Business Association, sat down after the Golden Bridges conference to chew the cud and swiftly discovered that, though they had never met before, they both hail from Bray, Co Wicklow. In fact their families came from the same street: Raheen Park. All of which confirms the old proverb in Spanish that the world is but a handkerchief. I flew home from a Baltic Boston on Saturday night, post the tenth annual Golden Bridges gathering linking Northwest Ireland and Massachusetts, from TF Green Airport in Providence, Rhode Island. Sharing the packed Norwegian plane with me were scores of supporters of Boston University ice hockey team who are just one of the US colleges competing in theFriendship Four tournament later this week. Born from a mad idea first aired at the Golden Bridges conference and nurtured into life by Mayor Marty Walsh of Boston, Robert Fitzpatrick of the SSE Arena and Steve Thornton of the Belfast Giants, the Belpot is now a major fixture in the US college sports calendar. And, of course, it also gives an unbelievable fillip to our tourism industry in what used to be the dead days of early winter. No sooner will the medals have been handed out at the Friendship Four than eight other US college delegations will descend upon us to take part in the Belfast Bastketball Classic – the brainchild of Gareth Maguire of Sport Changes Life. Cue another bumper week for our hotels and restaurants and a sold-out SSE Arena for a spectacle due to be broadcast coast-to-coast in the US. The icing on the cake will be the Belfast International Homecoming Business and Investment Conference from 28-30 November when all roads from the diaspora will lead to Belfast. There will be great sport at the Homecoming – even if there is no athleticism — but the serious business will be in forging friendships and cementing partnerships which lead to opportunities, jobs and investments. And what do those opportunities look like? Pretty much like the Friendship Four and the Basketball Classic, if truth be told. Or if investment is more your cup of tea, like the new offices in Ormeau Avenue housing several hundred employees of Philaldephia companyMRP where three proud Irish Americans hold the reins. Culture and heritage? Try the link-up between Great Hunger historian and Frederick Douglass biographer Christine Kinealy who will jet in from Quinnipiac University in Connecticut to join the famously abolitionist Moravian church faithful to explore escaped slave Frederick’s 1845 speeches in Belfast. Bolstering these inspiring collaborations with our global family will be a high-powered mission from our sister city of Boston led by John Donovan, liaison to the sister cities agreement for the Mayor of Boston. My favorite in his group is a businessman who is championing a proposal for a profitable air route linking Boston and Belfast direct! On Thursday past, I had the pleasure of popping in to Boston City Hall to touch base with Mayor Walsh, who signed two copies of the Belfast-Boston sister cities agreement back in May 2014 – one in English the other in his parent’s native tongue, Irish. Neither the mayor nor his trusted chief counsel Gene O’Flaherty will join us at the Homecoming, Friendship Four or Basketball Classic this year but their influence will be present in every puck whacked, in every basketball dunked and in every hand shook. Their roots may be, respectively, in Kerry and Galway but when it comes to helping Belfast — or for that matter Donegal and Derry — the duo respond as only proud family — our proud global family — can. 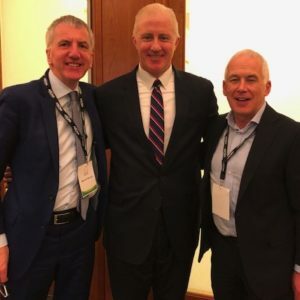 Global Family: Eugene O’Flaherty, Chief Corporate Counsel to Mayor of Boston Marty Walsh, with myself and Derry business leader Garvan O’Doherty (right), who addressed the Golden Bridges conference on his ambitious development plans for Fort George and Queen’s Quay in Derry. Máirtín Ó Muilleoir is the Sinn Féin MLA for South Belfast, a publisher, entrepreneur and civic leader. Get in touch with us below, or use our online contact form. 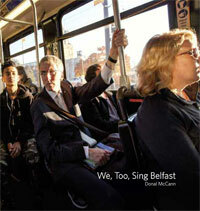 Donal McCann’s new photographic exhibition and accompanying book reflects how the city of Belfast connects with itself and the wider world through its first citizen.